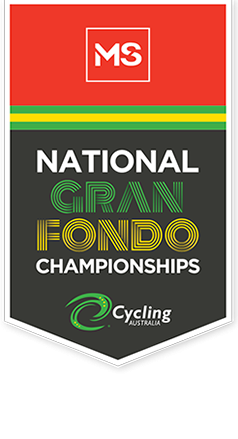 The MS National Gran Fondo Championships is an age group Gran Fondo event for men and women with a recreational ride option. On Saturday, 5 January 2019 cyclists have an opportunity to test themselves on the iconic Mt Buninyong circuit in Ballarat, riding to fight MS! Multiple Sclerosis Limited (MSL) have been selected to be the Charity Partner for the 2019 event. The Charity Partnership will highlight the challenges that people living with MS face every day and raise money to help them live their best lives! Cyclists will have 2 hours on the fully closed roads circuit, peddling along the scenic roads of Buninyong, on the same course that has catapulted the likes of Amanda Spratt, Katrin Garfoot, Miles Scotson and Simon Gerrans into Cycling History. You don’t have to be in it for the Championship glory, but instead, give your wheels a spin on the iconic course at a leisurely pace with friends and family. You will have the option to compete within your relevant age category for the championship or as a recreational rider. Entries are open to all cyclists, with cycling insurance included for any non-Cycling Australia members. Cyclists will complete between three and five laps of the course depending on their category. The Age Category Championships will be awarded based on the rider who completes 5 laps in the fastest time. There will be separate starting waves for Championship and Recreational Riders. The fee for online entries is $70, which closes on Thursday 3rd January at 5:00pm Australian Eastern Daylight Time (EDT). You will be able to print a registration form and register on the day from 6am. The on the Day registration fee is $95. This event gets the weekend’s action rolling at the 2019 FedUni Road Nationals. Come and be part of the amazing atmosphere at the FedUni Road Nats, with plenty of great family activities over the weekend, a community festival and Ballarat site seeing - this is a great weekend trip the whole family can enjoy! Your entry fee covers the cost of the event. Fundraising helps to support people living with MS.